A talented multi-skilled guard with handles, range, and instincts, Brookshire can take over the game scoring or creating and his feel combined with the efficiency of his skill set make for a high major guard potentially. He already holds a couple of Division 1 offers and he’s just starting to take off. Potentially a consensus top 25-50 national prospect big picture wise, Brookshire is one of the best kept secrets in the country right now. A multi-skilled scoring talent who handles the ball and can score at every level, Christie is a top 25-50 prospect nationally already but he’s not totally getting his just due. 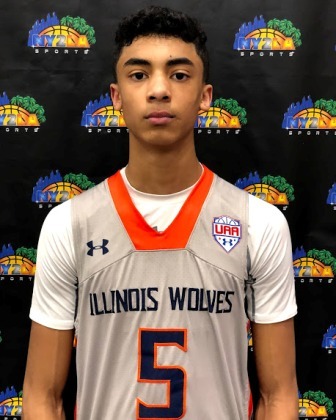 He already holds a number of Division 1 offers but the talented sophomore is one of the prized recruits in a loaded Midwest region for the 2021 class. Just getting started, Christie could potentially be the very best prospect to come through the Illinois Wolves spring and summer program when it’s all said and done. An instinctive big with size and potential, Courbat like most young bigs is really just getting started. He has a nice feel for the game, excellent physical tools in terms of size and length, and his ability to impact the game is further along defensively than it is offensively at this point. That being said he can finish with either hand, he’s shown an improved ability to score with his back to the basket, and he can face up and rip the net at multiple levels. A possible high major prospect when it’s all said and done, Courbat is one to pay close attention to in the 2021 class regionally and nationally. 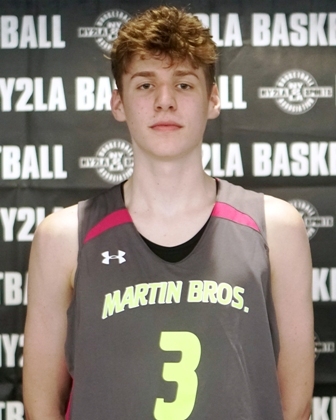 A long wiry plus length forward with instincts, feel, and a perimeter stroke that extends well beyond the arc, Holmgren was one of the breakout performers this past spring and the talented forward is already holding a number of Division 1 offers as a result. Still needing to develop physically in terms of strength, explosion, etc. like most young bigs, Holmgren is a highly intriguing talent who can take over the game at times with his face up scoring ability. He runs the floor, he has nice agility at times, and he’s feel for the game offensively in terms of passing and scoring as advanced. A high major prospect who’s just starting his ascent, Holmgren is a legitimate top 25 national prospect if he continues to grow and develop both physically and as a player. A hard-nosed blue collar guard in the mold of the likes of Matthew Thomas (Iowa State), Riley LaChance (Vanderbilt), Reed Timmer (Drake), and Zak Showalter (Wisconsin), Nau recently picked up a DePaul offer and it stands to reason that there will be more before it’s all said and done. He handles the ball well, he has excellent range, he sees the floor, and he has excellent leadership ability. Combined with a willingness to do whatever it takes to win both offensively and defensively, Nau is an intriguing young guard who will make a mid or high major Division 1 coach very happy in a couple years with his ability to be an extension of the coach on the floor.